I need no bodyguard at all, for even the bravest men who approach me get weak at the knees and their hearts turn to water, whilst their heads become giddy and incapable of thinking as the sweat of fear paralyzes them. 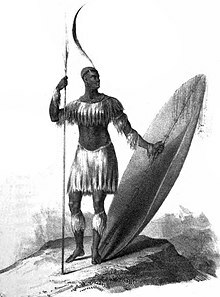 Shaka kaSenzangakhona (c. 1787 – c. 22 September 1828), also known as Shaka Zulu [also spelled Tshaka, Tchaka or Chaka], was the most influential leader of the Zulu Kingdom. Up! children of Zulu, your day has come. Up! And destroy them all. I need no bodyguard at all, for even the bravest men who approach me get weak at the knees and their hearts turn to water, whilst their heads become giddy and incapable of thinking as the sweat of fear paralyzes them. They know no other will except that of their King, who is something above, and below, this earth. Women that bear children must exist in Zululand only. The Shaka story … has a Faustian quality. A tale of temptation, it asks what price a person is willing to pay, how far he is willing to go, to obtain power. In revealing Shaka's heart of darkness, it reveals the dangerous consequences of closing a pact with the devil: hubris, violence, death. And it warns of the presence of these destructive forces in all of us. Shaka is himself in this story, but he also represents the darker, shadow side of humankind generally. We see ourselves when we watch him become so obsessed by power that he sacrifices human relationships for what the devil (in the person of malevolent diviners and witchdoctors) can offer him, and when he loses the ability to distinguish between killing for a just cause and wanton killing for killing's sake. The ending is predictable, surely: loneliness and despair. Shaka ends up on a throne of blood, isolated from his fellow human beings, struggling with depression and despondency. "Shaka Zulu's brutality was exaggerated, says new book" by Rory Carroll in The Guardian (22 May 2006).